The Awak Mas Gold Project is held under a 7th generation Contract of Work (CoW) signed with the Government of Indonesia (GoI) in 1998. The CoW covers an area of 14,390 hectares and is held by Nusantara’s 100% owned local subsidiary company, PT Masmindo Dwi Area (PT Masmindo). In 2009, the GoI introduced a new mining law that required existing CoWs to be adjusted consistent with the provisions of the 2009 Mining Law. The CoW was amended in March 2018, reaffirming PT Masmindo as the legal holder of the CoW, with sole rights to explore and exploit any mineral deposits within the CoW area until 2050, with options for two ten-year extensions. The Project is located 45km by road from the capital of the Luwu Regency, Belopa, on the east coast of South Sulawesi Province, Indonesia. The nearest major centre is the coastal port city of Palopo, 60km north along the coast from Belopa. The Project site may be accessed from Makassar, the capital of Sulawesi and Indonesia’s fifth largest city, via a 370km paved road to Belopa, or by the daily flight service from the regional airport at Bua. 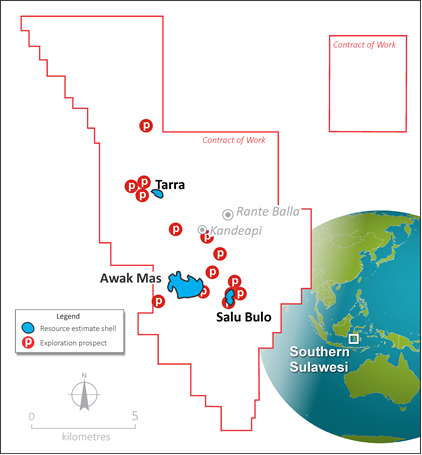 Figure 1: Awak Mas Gold Project location in Indonesia. The Project has been the focus of intensive modern-day exploration since the discovery of the Awak Mas gold deposit in 1991 by a succession of international exploration and mining companies including Battle Mountain Gold, Lone Star Exploration, Gascoyne Gold Mines, JCI, Masmindo Mining Corporation, Placer Pacific, Vista Gold and most recently by One Asia Resources. To date, over 130,000m of drilling and several development studies have been completed. Episodes of sub-vertical mineralisation feeding into foliation parallel veins with progressive reactivation of sub-vertical structures providing a higher-grade overprint. Awak Mas and Salu Bulo mineralisation is characterised by low sulphidation, crackle breccia, vuggy quartz infill and stockwork quartz veining. A 2.0 Moz Indicated and Inferred Resource was estimated by Cube Consultants in May 2018. All Mineral Resources are reported in accordance with the JORC Code (2012). The May 2018 Mineral Resource is reported at a cut-off grade of 0.5 g/t Au and constrained within US$1,400 per ounce optimised pit shells. The previous mining, metallurgical and infrastructure work along with advanced-stage permitting, provides an enhanced launching point to rapidly take the project forward, with a Definitive Feasibility Study (DFS) completed in October 2018, ahead of an investment decision for development, which is expected in late 2018. Nusantara’s review work to date indicates that the defined resources are best suited to exploitation by open cut methods. One operational benefit is the flexibility bestowed by several pits rather than a single pit. The DFS confirmed a technically robust, long-life and low risk project, with a high ore mining and processing rate of 2.5 mtpa, low project strip ratio of 3.5, high gold recoveries of over 91% through a conventional CIL processing plant. The project has access to good infrastructure consisting of power, water, ports, airport and roads. The availability of low cost, stable grid power provides a significant opportunity for low cost processing of gold. Permitting is well advanced, with the AMDAL (environmental) permit already received and in January 2018, the Project received a Government Decree which progressed the CoW from the three-year ‘Constuction Period’ into a 33-year ‘Operation and Production Period’. This outcome provides certainty of the CoW for the next 33 years for the development and operation of the Project until June 2050. The CoW is situated in land classified as Area Penggunaan Lain (APL) (land for other uses), a non-protected forest area that readily allows for activities beyond agriculture such as mining. In addition to the near-term development opportunity, there is good scope to grow the resource base through potential extensions to the Awak Mas and satellite Salu Bulo and Tarra deposits. The Project’s location within a significant but underexplored gold field also offers excellent potential for further discoveries. The gold field remains largely open, hosting numerous satellite targets along regional trends where previous trenching and scout drilling has identified ore grade mineralisation. Recent work has outlined two corridors recognised as containing most of the targets thus far identified. These are the ’Mine Corridor’, lying essentially between Awak Mas and Salu Bulo and the ’East Corridor’ spanning between Salu Bulo and Tarra. A new exploration program for the CoW area commenced in the second quarter of 2018, with a focus on previously identified exploration prospects. Initial results have indicated extensive surface gold mineralisation with localised copper mineralisation at Salu Kombong prospect. It is anticipated that this program will develop a geological understanding of each prospect through new sampling and mapping, which will then underpin a prioritised exploration program.